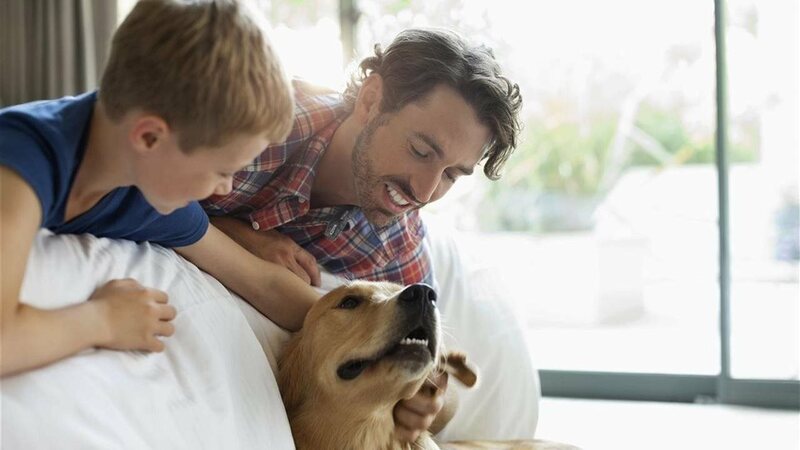 * Find a quality pet sitter. Dogs need to be walked and let out during the day, so when you’re gone, you’ll need a pet sitter to fill these duties. Finding a quality, reliable pet sitter can be the difference between a happy pet and damage to your home when you return. Try to trade sits with a fellow pet owner, and if that’s not possible, the National Association of Professional Pet Sitters is a nonprofit organization with resources to help you find the best pet sitter for you. * Be mindful of the temperature. Knowing the temperature patterns in your destination city plays a big role in how you pack, but have you looked at what the weather has in store for your home while you’re gone? Allowing your home to get overly hot while you’re away isn’t good for your pet. You can control the temperature in your home — even while you’re away — with the Coleman Echelon Hx Touch-screen Thermostat. This WiFi-enabled smart thermostat provides more than just comfort, it monitors the temperature in your home, allowing you to always be aware of your home’s temperature. And best of all, it’s completely controllable from your smartphone, so even if you forget to make adjustments before you go, resetting the temperature in your home is just a click away. * A little cleaning goes a long way. Your pet really isn’t that different from you; they appreciate a nice clean area to live in as well. Give it to them before you go by making sure the litter box or the yard is clean and that you’ve picked up as much clutter as possible. Wash the blankets that adorn their favorite sleeping places and make sure the space is ready for their use. * A little TV time. If commotion is the name of the game in your home, a house that is suddenly too quiet could have a negative impact on your pet. To alleviate this concern, leave the television on in one of the rooms so your pet can enjoy a little noise in the background. Just make sure you choose a room that is different from where your pet often sleeps so they can comfortably avoid the sound if they want to. * Leave a little bit of yourself. Is it possible to be in two places at once? In some ways yes. Leaving items out that smell like you — laundry or blankets, for example — can be a wonderful source of comfort in instances when your pet is feeling stressed. Just remember that if your pet likes to chew, these items could be their first target, so only leave things you’re comfortable losing.